Good Soda Cake 4 Tea-cups of Flour, 3 ditto ditto of powdered loaf sugar, 3 Eggs, 1 Tea-cup of Milk, 1 1/2 Tea spoonful of Soda, 9 oz of Butter, 12 oz of Currants. Mrs. E. Bucks receipt. A Good Paste for Tarts 1 lb of Flour, 3/4 lb of Butter. Mrs. E. Bucks receipt. Ordinary Paste for Tarts 1 lb of Flour, to 1/2 lb of Butter Mrs. E. Buck's receipt. 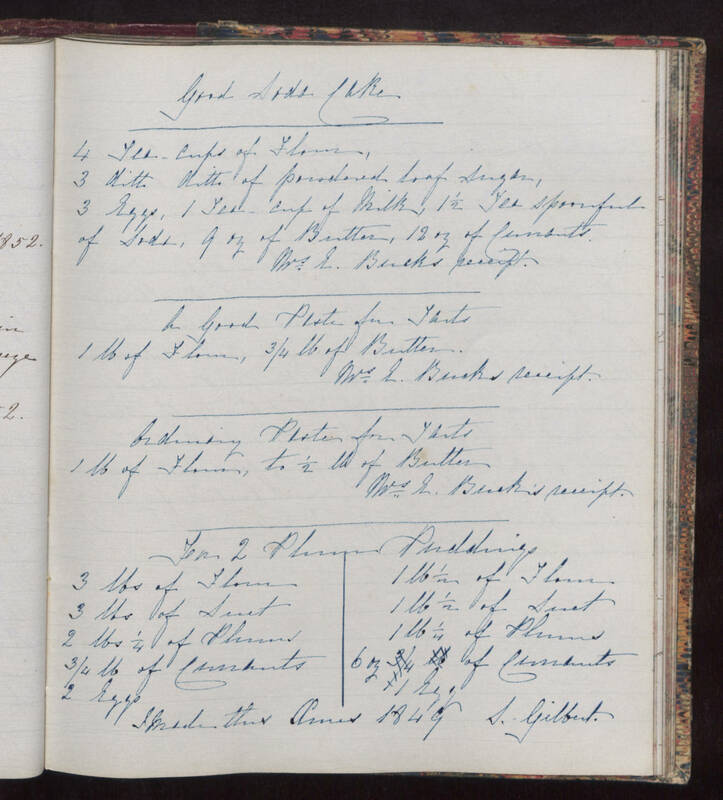 For 2 Plum Puddings 3 lbs of Flour 3 lbs of Suet 2 lbs 1/4 of Plums 3/4 lb of Currants 2 Eggs 1 lb 1/2 of Flour 1 lb 1/2 of Suet 1 lb 1/4 of Plums 6 oz of Currants 1 Egg I Made this Xmas 1849 S. Gilbert.